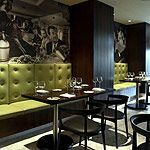 Napa is located within the Chiswick Moran Hotel and serves a Modern British menu which changes regularly to take full advantage of fresh seasonal produce. Do you work at Napa? What did you think of Napa? Napa is unlike your average hotel restaurant, offering a relaxing retro retreat with great British food and charming service. Hidden within the Chiswick Moran Hotel - and designed by Project Orange - Napa is West Coast meets West London, with a mix of Fifties and Sixties Californian retro glamour thrown in for good measure. It feels very open as it trails from the right of the main lobby but it still manages to set itself apart from the hotel proper. Crisp green and brown flourishes give Napa its distinctive edge. 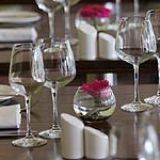 Everything appears perfectly placed, with each furnishing having a purpose, transporting your dining experience back in time. 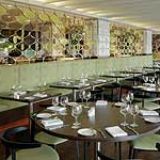 A screen of coloured plexi-glass ovals sit between stainless steel curved bars that line the centre of the restaurant, separating the restaurant bar and the dining area. Black and white canvases of cabin shots from a 1950s British Airways advertising campaign line the back walls and floral leather chairs, laminate ebony flooring, veined marbling and dark wooden tables hint at sophistication. The detail throughout Napa's design reflects the thought they put into the food, drink and service. 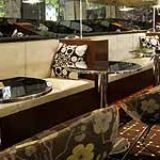 This is a chilled and stylish place to enjoy a great meal. 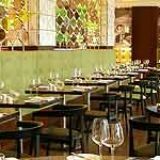 Staff are attentive and knowledgeable on the menu, even with the regular changes that occur to keep in line with seasonal produce. Being a hotel, the customers do vary, from the lone traveller to business partners via groups of friends. The majority of Napa’s customers are guests, which is a shame as the food and service is equal to that of any top class restaurant. Napa is certainly somewhere that would benefit from pulling in a few more local customers - you get the feeling that it would definitely help the atmosphere . The menu concentrates on British dishes, with an emphasis on fresh seasonal ingredients. To start off the meal a selection of bread is brought to the table, including Irish soda bread, which is a perfect match for the fresh white Dorset crab with spiced avocado and tomato dressing (£8). Also recommended is their seared foie gras with poached pears and roquette (£12.50), which has a rich buttery texture that melts in your mouth. For the mains, the crowd pleaser is the open beef wellington (£24), with a succulent fillet of beef that sits on a bed of light flaky pastry, covered by a dome like lid protecting the tender fillet housed underneath. This is accompanied by a rich Madeira sauce which is packed full of flavour. The confit leg of duck on a bed of mixed bean and Toulouse sausage cassoulet (£16.50) is a real winter warmer, and is bursting with flavour. Other firm favourites include their succulent steaks which start at £18.50 and are matured for fourteen days on the bone, and fourteen days off. The dessert menu is a haven for any sweet tooth; there's even a (very generous) chocolate fondue with marshmallows, strawberries and mini pastries. The pastries are warm and flaky and absorb the rich chocolate sauce, literally melting in the mouth. There is also an art to dipping the marshmallows, with a fine line between dunking them long enough so they became gooey to leaving them to the point that they fall off the skewer into the chocolate abyss - be careful with these precious goodies. The wine list consists of a good selection of choices from both Napa Valley and other regions from across the world. A bottle of Chilean Cabernet Sauvignon will cost you £16, and a pint of Fosters comes in at £3.65, if you're so inclined. There's also a cocktail list available for those feeling fancy. A visit to Napa makes for an enjoyable evening, whether it be an after-work gathering or an intimate dinner. This place has personality and is the kind of place you'll definitely want to return to.